Family grouping creates an environment where children learn from each other in a spirit of cooperation. Younger children observe and often follow the lead of more competent children. Older children practice patience and verbal skills in a nurturing role and have the opportunity to express leadership and responsibility. The sensitivity of taking care of each other leads to increased pro-social behaviors such as sharing and helping, and resembles the comfort and security of a family. Varied levels of development promote inclusive awareness and practices of individuality for both children and teachers alike. 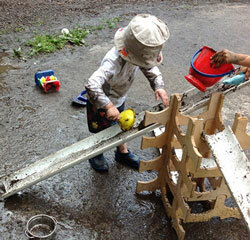 An emergent curriculum builds upon the interests of the children. Through observation of play and conversations, teachers become aware of topics children are interested in learning more about. Together, they develop questions to explore and activities to extend and enrich learning. Accessing community resources and a separate disciplinary teacher in Art, are integrated into classroom experiences to extend this learning. This approach reflects children’s desires to learn and builds motivation for a long-term love of learning. Teachers complete a developmental assessment two times a year and families are offered a conference opportunity to discuss their child’s growth and development. A diverse community of families allows children to experience a variety of cultures, appearances, languages, and life styles in a positive, affirming environment. 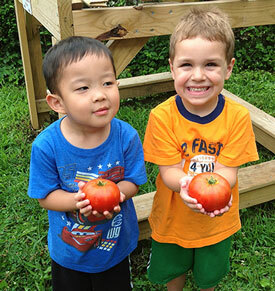 Within the context of family grouping, the TCDN preschool program helps children understand and appreciate the differences and similarities among us all. Families are encouraged to share their cultural traditions with others in the program.